number – The value for which you want to find the rank. ref – An array of values containing the supplied number. [order] – order of the rank i.e. ascending or descending order. The [order] argument can have the value 0 or 1. 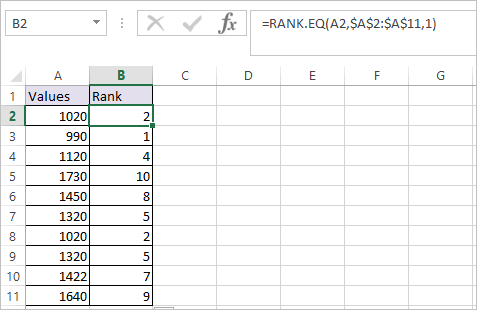 If the numbers are same then the same rank is allocated to them. In our example the value 1020 is found twice and ranked 8th for both the occurrence .Rank 9 is left unused because we have given Rank 8 twice. If the [order] argument is 0 then the rank is calculated in descending order. If the [order] argument is 1 then the rank is calculated in ascending order.